It was Back to the Future that dominated much of the geek culture this week, but let's not forget that we also got a new trailer for The Force Awakens and the tickets went on sale. I picked up my IMAX seats for Saturday night, and I'm pumped. I am reminded of the saying "fool me once, shame on you...fool me twice, shame on me", but I'm still pumped. Disney's 'elite' series of action figures brings die cast metal to the party. 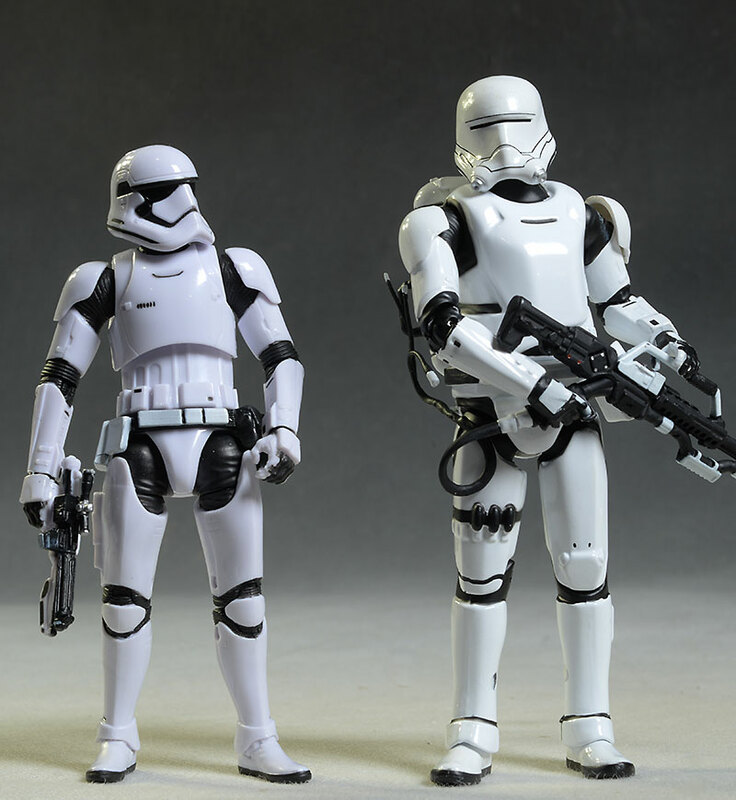 These figures are slightly larger than the now standard 1/12th scale of the Hasbro Star Wars Black series, or any of the other licensed 6" collector lines on the market, coming in closer to 7" than 6". But they've found a market, and sell out quickly when a new character pops up at their online store. 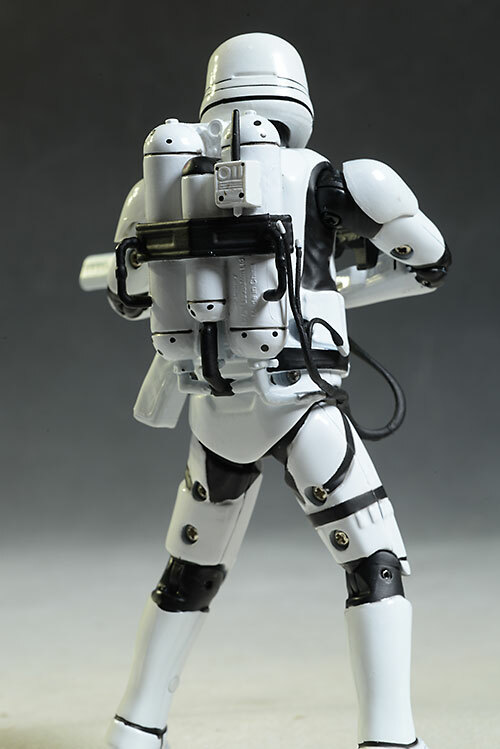 I snagged a Flametrooper last week, largely because this is a costume design I really like. 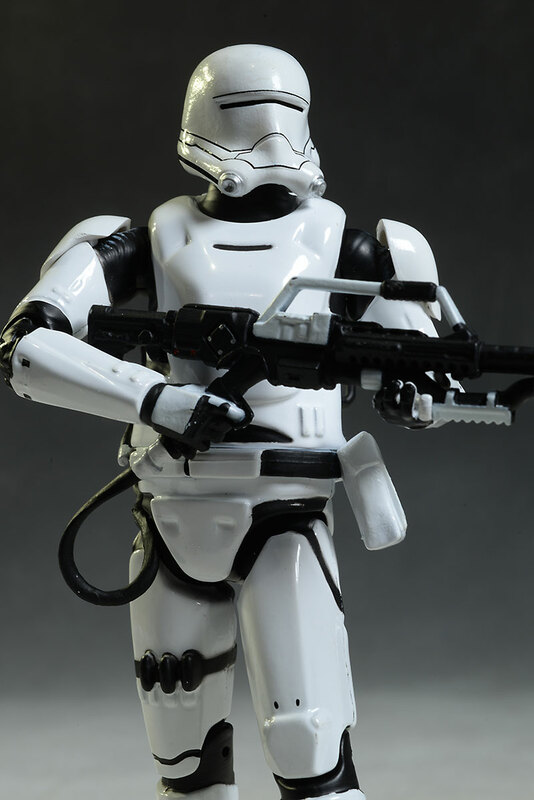 Just how much screen time he gets remains to be seen, but I'm betting he joins the ranks of the Snowtroopers and Sandtroopers in popularity. These will cost you around $25 from either the brick and mortar Disney stores or their online counterpart, and are shipping now. As I mentioned, these figures have a high percentage of die cast metal, making them quite heavy. That means the boxes must be sturdy, and they were clearly concerned that the figure would shift around inside the package during transit. They've twisty tied this sucker in with 8 wires, so a handy pair of cutters will be helpful. That makes it a lot less 'collector friendly', and a lot more annoying to open. It does show off the figure nicely though, and if you're a MIBer, the box will hold up to storage and display. As I mentioned, these figures aren't 1/12th, but closer to 1/10th. 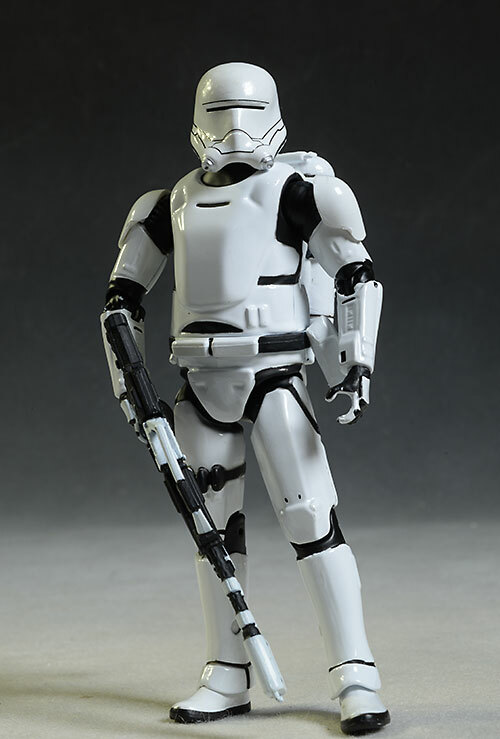 This trooper stands about 6 3/4", and has the additional bulk to fill out the volume properly. 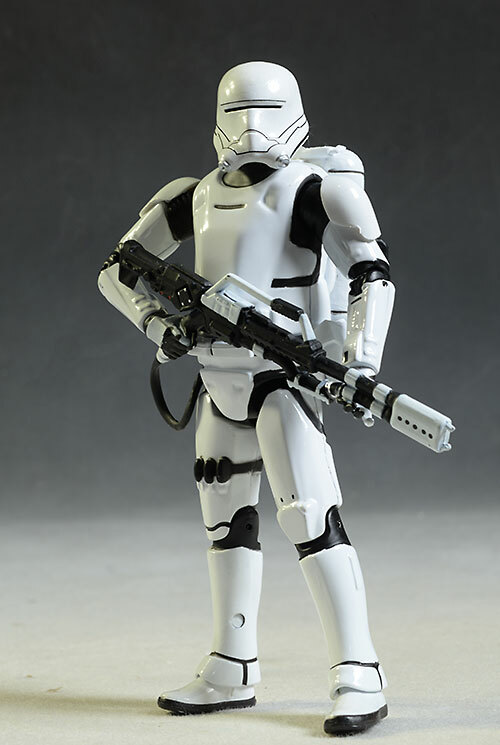 I've included a photo at the end of the review of this figure with a Star Wars Black 6" scale FO Stormtrooper for comparison. Because these are die cast, the sculpted details are softer, less defined. That actually makes the real material look less realistic than the fake material, a situation we often see with sixth scale figures as well. While that's a downside, it's hard to argue with the sheer heft that the metal provides. There's something about that weight in your hand that says quality, and that's an impression that's tough to shake. Another downside to the metal is the inclusion of screws in the back of the figure, particularly in the limbs. 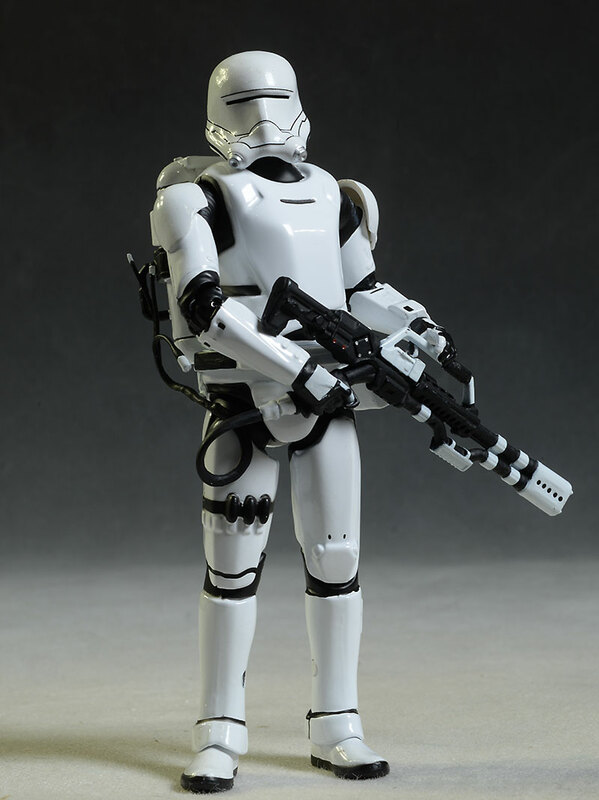 Thanks to the suit design, the screws are a little less obvious here than they were with the Stormtrooper, but they are still very much there. I do love this design, and the detail work on the pack and gun is terrific. However, that's where the biggest problem also lies - the gun is permanently attached to his right hand. It's also permanently attached to the pack, although this isn't quite as major of an issue. This means it's not an accessory, it can't be adjusted, and you can't pose him in any non firing mode. Even posing him with the gun down is difficult, since it's so long it reaches the ground in an upright stance. There's no real excuse for this either. The gun should have been left separate from his hand, but could have still been attached to the pack, with a place to hook it somewhere. Or it could have been detachable from the pack and removable from the hand, allowing you to pose him in a million more ways. There's even a handle on the top of the weapon, and he could have have been posed holding this in his right hand in a relaxed way. But not with this arrangement. Attaching this weapon to his hand permanently hurts his Sculpt, his Accessories, and his Articulation, some more than others. The paint on metal is clearly superior to the paint on/in plastic. You get a cleaner, brighter white, and it has an enamel feel to it that further adds to that impression of quality. Lines are sharp and details are well defined, particularly on the pack. There's a little variation in the white where it is on plastic pieces - like the hands - versus the metal armor, but that's one of those minor nits that only the ultra picky (like me) will notice. 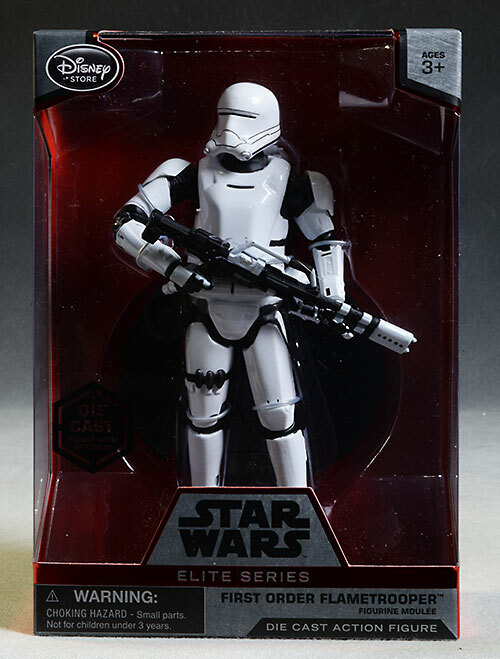 While the regular Elite Series Stormtrooper had some issues in this category, I was a little less harsh with him. That's because although his articulation was limited, it was still useful in creating a reasonable number of poses. That's not the case here. He still has the ball jointed neck, and it works nicely. The rotating hinge shoulders and hips work well, but with no rotation in the hinge joints at the elbows, knees or ankles, There's no way to turn the arms or legs inward or outward. The waist has a cut joint that's restricted quite a bit by the pack design, and there is no chest joint, making the torso one solid, straight piece. Almost all of that was true of the regular Stormtrooper as well. The big difference here is that the right elbow, which is only a hinge joint and can not turn, is designed to bend inward toward the body, perfect for one pose and one pose only - the one you see them using in the package. 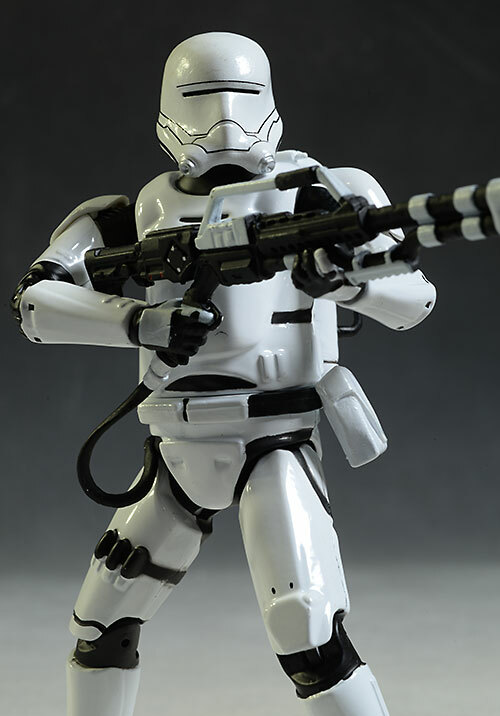 This allows the non-turning elbow to hold the gun across his body, so that the other hand can hold the stock. But it doesn't do it in a particularly realistic way, and because the weapon itself can't be moved at all within the hand, it's still a tremendously limited pose. 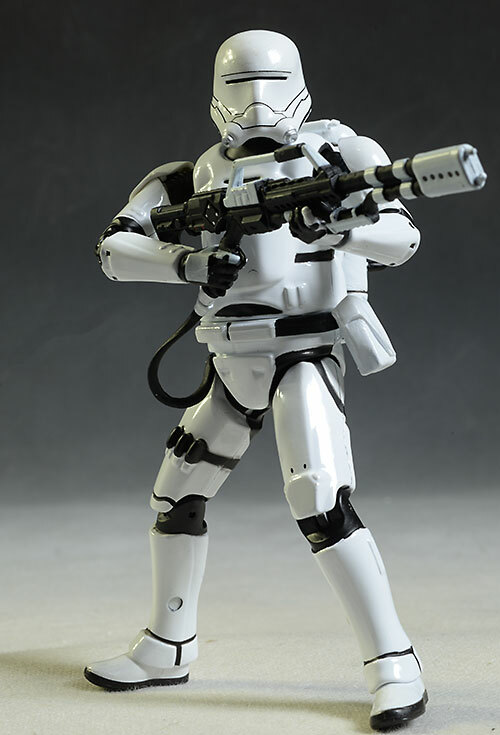 Since neither the pack or gun is removable, he only has one accessory - the round, black display base. It's pretty simple stuff, and doesn't warrant much of a score here. With a gun that can't be adjusted, no additional accessories, and articulation that limits poses to fewer than you have fingers on one hand, this guy isn't going to be a lot of fun. I'm hoping for a Star Wars Black version that corrects these issues. Twenty five bucks is a solid price for a die cast figure...when it's a good figure with some accessories and posability. You lose both of those things with this guy, making him a worse deal than the other releases in the series. Be careful when working with the gun and the hand. The gun is made from a softer plastic, and will bend and potentially rip if you put too much pressure on it at key points. It's pretty amazing how often a figure can look like a winner in the package, and then you open it up to find out you've been hornswaggled. That's the situation here. Because of the specially designed right elbow and the permanently attached gun, this guy is a lot less fun out of the box than within. And that's never a good sign for a toy. I will be looking to pick up others in this series, particularly with the armored characters. It's not a series I'll be a completist on, but cherry picking is definitely an option. I wish they were in a smaller scale - don't we all - but if they produce enough interesting characters it will make for a decent independent display. And that's the real question...will this line have enough juice to go deep enough to make it worth picking up? Only time will tell. This is a Disney store exclusive, so either at your local location or at their online store is your best option. Of course, you can always search ebay for a deal. 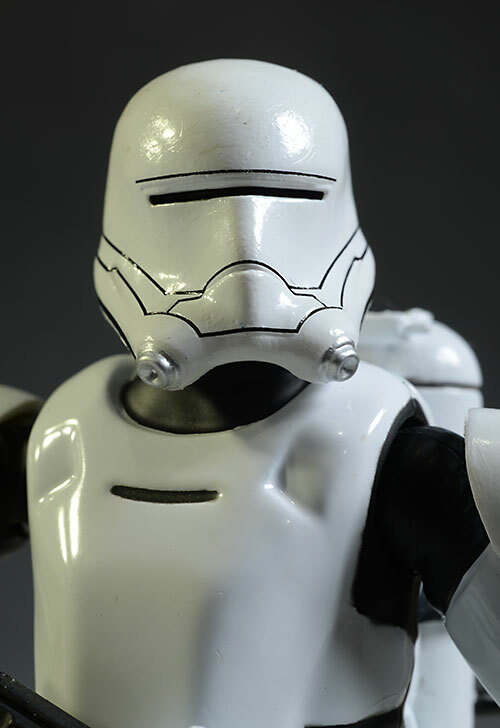 I covered the Elite Series First Order Stormtrooper as well, and I suspect I'll be picking up a few more as they move forward, particularly when they get to Darth Vader and Boba Fett.